When I see a fruit I haven’t tried, my curiosity gets the better of me. I’ll try anything once. So, what the heck are honeyberries? 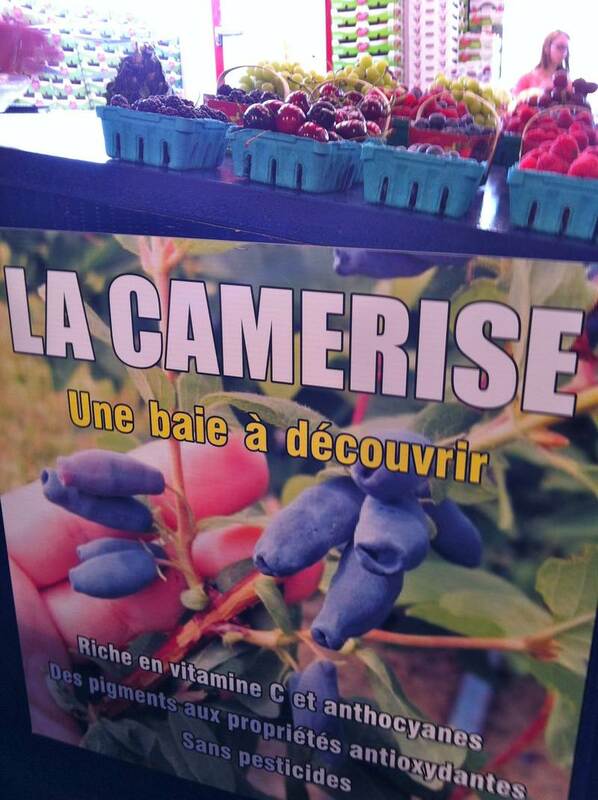 I was introduced to them in French, at the Atwater Market, as “la camerise.” They look like elongated blueberries and are said to taste like a cross between a blueberry and a raspberry. I tasted before buying and will happily keep sampling my way through the pint. They marry well with Greek yogurt, banana and balsamic reduction. At the last moment, I sprinkled on some Alor ground vanilla, or ground vanilla beans, which added even more intrigue into this simple snack-dessert. Don’t take my word for it. Contact your local produce market asap (they have a short season) and rustle up some wild and crazy honeyberries. Make a mound of thick Greek yogurt on a small plate. 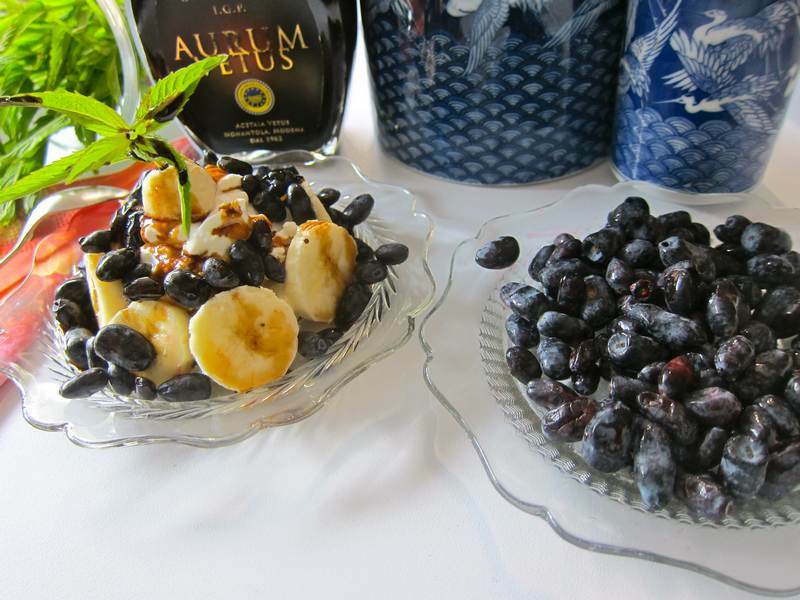 Surround with banana slices and honeyberries. 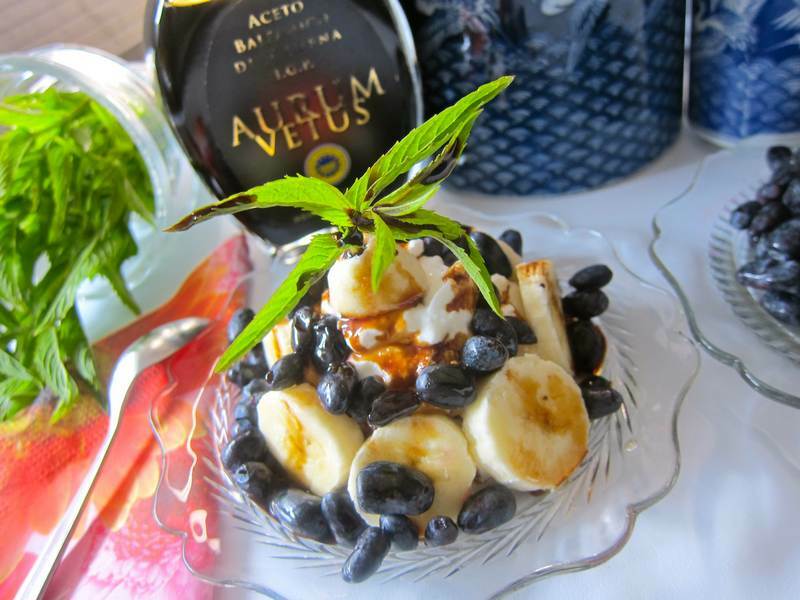 Garnish with mint, then drizzle with thick, aged balsamic vinegar, and sprinkle on ground vanilla beans. Serves 1. Eat up, and if no one is looking, you can lick the plate. Next weekend will be the best time to go blackcurrant picking to make wonderful blackcurrant jam, vodka or frozen yogurt. You may even want to try your own blackcurrant jam on homemade ricotta. See you at Paradis des Fruits. Check their site before going to make sure that the blackcurrants are plentiful. Thanks! Beautiful, healthy and delicious. What more could we ask for? I’ve been waiting for the perfect opportunity to trot out that balsamic vinegar. Looking forward to seeing what else it can enhance.